Is it true that Painted Lady butterflies can be raised inside my home during the winter months? Is this humane? And if the answer is yes to each question, do I understand that you can provide the necessary host plants or nectar plants for them also? Yes, you can buy painted lady butterfly kits and raise them inside - they are easy to raise. I personally would want to wait until spring when the weather warms up in Wisconsin (60 degrees or so) then you can release them in the wild after you have raised them. For people in the Southern states, you could probably raise them year round. The kits provide you with food for the caterpillar. 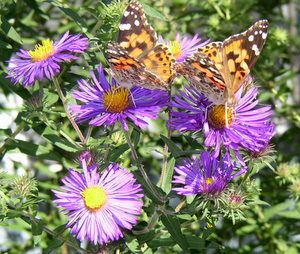 The painted ladies love the New England Aster in my garden! Hope this helps. Can i take my terrarium and painted lady chrysalis (soon to be butterflies), and keep it outside, if it's mild. The terrarium is made of screen. LOTS of painted lady butterfly eggs! Ok, so I've been putting in paper towels soaked in sugar water for our butterflies that emerged. Then I noticed some blue dots on them and didn't know what it was...now several days later I can see tons of little black caterpillars crawling around in the habitat! aak! I put a sunflower in it today and literally watched a butterfly lay some eggs on it. Could not believe it! There are two butterflies that have been at it all week. haha! So, now I don't know what to do with all these eggs/caterpillars...I don't know if I should just put the whole habitat outside or what?! I have searched everywhere for mallow or hollyhock but can't find anywhere. Does anyone else know what i can use instead? Other ideas for painted lady host plants include: thistle, basketflowers, Cornflowers, sunflower, sagebrush and wormwood. Hope this helps. Could it be any more cruel than keeping fish? I really feel that if you make certain to provide good conditions as to food, cleanliness, water etc, it's not cruel at all. They have no knowledge of life in the wild, if you purchased them online. Why not enjoy them and give them a pampered? We had no mallow last week, and I read that they also eat asters, so I put black-eyed susans and sunflowers in the habitat. But now our hollyhocks are coming up, so I can clip some and see if that makes a difference. The kit contained caterpillars, which turned into butterflies, which laid eggs that aren't hatching. It has been a week. The eggs remain unhatched on the leaves and flowers (black eyed susan) on which they were laid. Interesting...the host plant for painted ladies are in the mallow family (hollyhock, etc.). I wonder if the fact they were laid on a non-host plant makes a difference. My daughter got a butterfly kit. Fast forward, they laid lots of eggs that don't seem to be hatching. Any ideas about what the problem might be? How long has it been? It takes about a week for the eggs to hatch. Also, the caterpillars are tiny and black and it is hard to even recognize that it is a caterpillar. I would think it would be unusual if you have "lots of eggs" that some wouldn't hatch. The only thing I can think of is that possibly there were extreme conditions during shipping that killed the eggs. Good luck! your son should simply just keep the butterfly in a warm environment and don't stroke or pet the butterflies wings because the butterfly has protective scales on its wings and if you rub them it will have no more left. It looks like dust. Keep it away from birds too. We bought a painted lady kit for my son and when the butterflies emerged it was too cold outside to release them. They mated and laid eggs. Now we have butterflies galore. I've been wondering what to do when it comes winter and the mallow I've been feeding them dies. I've heard you can delay egg hatching by placing them in the refrigerator and I've also heard that caterpillars hibernate. Otherwise you have to come up with a food source, either by buying the artificial food online or transplanting the host plant and keeping it inside. I haven't had any luck transplanting mallow. Perhaps I'll try thistle. As to the question of cruelty. I've grappled with the idea and it seems everyone has their own opinion. I just came from a website that said that releasing captive butterflies into the wild is harmful for wild butterfly populations and migration patterns and that buying butterflies online in the first place is unethical. I thought that was a bit harsh. My sons teacher had a kit and the day after they released the butterflies it snowed. Strange weather for May - I'm sure all the butterflies died. They were just doing what most sources tell you is the "right" thing to do, saving them from a life in captivity. I had a butterfly that was left alone after its brothers and sisters died. I didn't want it to die alone in captivity so I released it. Four days later my son captured what I am certain was the same butterfly. It was in very sorry condition with a big chunk taken out of its wing. The truth is that they are subject to predators in the wild and that butterflies in captivity live longer. I don't think its anymore cruel than taking any other animal as a pet as long as you realize that you have a responsibility to provide it with a suitable habitat, food, and whatever else it needs to complete its life cycle. Let me know if you have any tips for keeping a good food source throughout the winter. My opinion is that it seems OK if you have a "safe place" and the solarium has enough space and plenty of nectar and host plants and extra nectar for the butterflies. Let us know about your experience if you do this. Well, I was actually interested in raising them during the winter inside the solarium. There is an author of butterfly books that said he and his family keep butterflies year round and enjoy painted ladies. IF I had lots of plants and lowers for them to frolic on, and also extra food for them like fruit etc. watermelon, would it be cruel? Opinions are welcome.........I want to so badly I'm not sure I can be objective. Thanks for feedback.